St. Veronica is identified with a hemorrhaging woman in the New Testament Gospel of Matthew (19.20), which reads: "And behold, a woman which was diseased with an issue of blood twelve years came behind him and touched the hem of his garment, for she said within herself, `If I may touch his garment I shall be made whole.' But Jesus . . . when he saw her said, 'Daughter, be of good comfort, thy faith hath made thee whole." It is known from the Gospel that Veronica was not only a real person but one who was aging and who was but one of many healed by the Savior. Thereafter, she is said to have had a statue of Christ, arms extended to comfort the world, erected and placed in front of her home as a token of her gratitude and reverence. St. Veronica, whose name is a compound of the two words "Vera" and "Icon" which means true image, has origins none too distinct. The Western Church has suggested that she was originally known as Martha, the sister of Lazaros, but the Eastern Church disputes this and, in fact, she is referred to by some Eastern theologians as having originally been named Berenike. This welter of names and origins has in no way detracted from her image as a pious woman of God who has come down to us as Veronica, who by any name would have been ennobled by her close association with Jesus Christ. On the first Good Friday, St. Veronica was the woman who stepped out of the crowd and wiped the perspiring face of Christ as he struggled to carry the Cross on the road to Calvary. 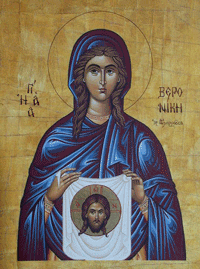 The cloth she used miraculously retained an imprint of the countenance of the suffering Messiah, an incident which gave rise to the legends which surround what has been called Veronica's veil and which has been the subject of many moving tales. This incident also produced thereafter a number of veils, all of which reverent Christians came to look upon as genuine, not daring to deny any of them for fear they might be denying the actual veil of Veronica. St. Veronica married a Christian convert named Zacchaios who joined her in all of her religious efforts, which were considerable and included missionary work, during which time she held tight to her precious veil. She was called to the side of the ailing Emperor Tiberius, whose physicians had given up hope, but at the mere sight of the veil which Veronica held forth, who was cured of his malady. Together with her converted husband, Veronica undertook to carry the message of Christ to remote areas, concentrating on what is now the south of France. At about this point in the history of the Church, Veronica, drops out of sight and nothing is known about her final days, although several versions are offered in legendary accounts.